he Tower of the Winds is a unique scroll book that follows the written record of a wondrous monument standing at the edge of the Roman agora in Athens. 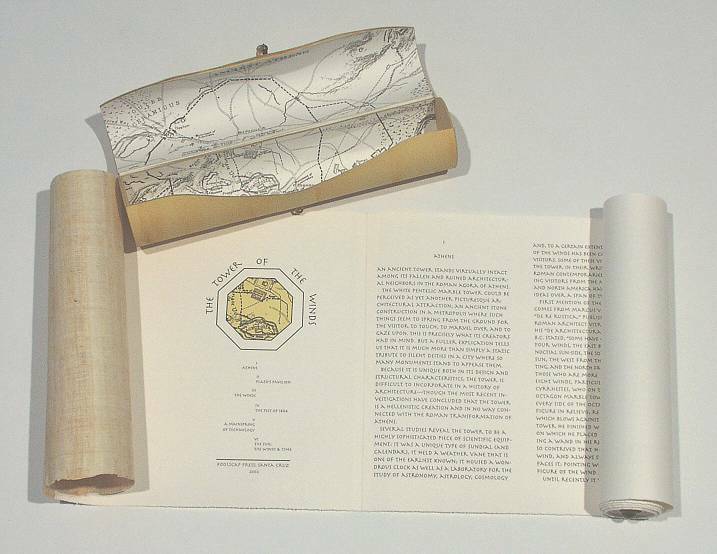 The Tower of the Winds is an original Foolscap Press edition both in content and in exterior form. 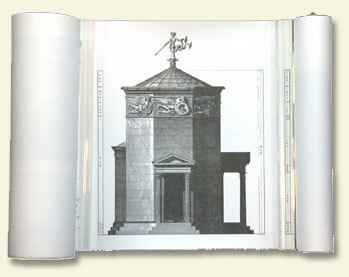 The text follows the written history and compiled science of an intriguing building that was constructed as a monument to mythology and to house the most advanced in scientific instruments. The tower has had many functions both mechanical and spiritual, and much of it has been "explained" by scholars from antiquity up to the present time. Yet the Tower of the Winds was and still is a mystery to those involved in the complex study of it. The Tower of the Winds is housed in a formed sculptural/architectural case. 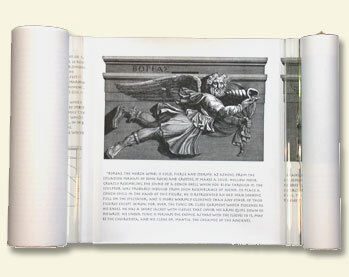 The book, a pre-codex form, allows the reader to scroll through history viewing the subject along a panorama twenty-five feet in length. The reproductions of the tower are from the remarkable artwork of James Stuart and Nicolas Revett, the British architects whose written description and exquisite drawings inspired a new architecture in England and influenced Thomas Jefferson and others in America. As you read you learn the captivating history of this strange monument through the voices of early Romans, a Turkish traveller of the seventeenth century, and modern scientists. "Some have chosen to reckon only four winds, the East blowing from the equinoctial sun-side, the South from the noonday sun, the West from the equinoctial sun-setting, and the North from the polar stars. 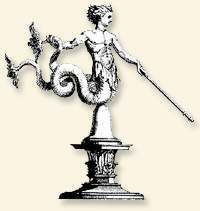 But those who are more exact, have reckoned eight winds, particularly Andronicus Cyrrhestes, who on this system erected an octagon marble tower at Athens, and on every side of the octagon, he wrought a figure in relievo, representing the wind which blows against that side; the top of this tower he finished with a conical marble, on which he placed a brazen triton, holding a wand in his right hand; this triton is so contrived that he turns round with the wind, and always stops when he directly faces it: pointing with his wand, over the figure of the wind at that time blowing." The Tower of the Winds can still be seen today in the Roman agora at Athens. It is a glorious survivor in a field of ruined columns and it is a monument for which, according to one modern scholar, "there is nothing comparable in all of Greek architecture..."
This edition is created as a wonderful biblio-artifactan object, a bookthat offers an inspired look into the mystery of The Tower of the Winds. 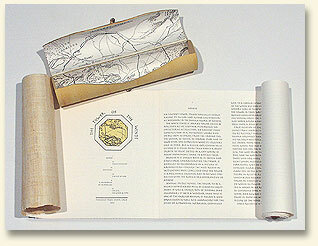 The Tower of the Winds is a scroll book that measures 11 inches by 25 feet in length. The papers are Zerkall Book and hand-made papyrus from Egypt. The typeface is Adobe Herculanum printed letterpress on a Hacker Hand Press. 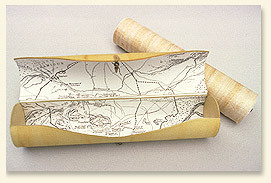 The scroll cases were produced at the press from dyed, hand-shaped Arches paper. 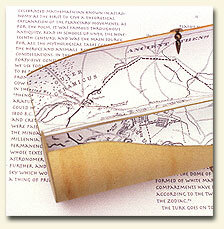 Each case is a rigid cylinder that is hinged with cloth and is lined with a map of ancient Athens. The edition is limited to 200 numbered copies. The price is $325. Orders may be placed by telephone, email or letter. Please include $15 for shipping. State sales tax applies to California residents. Book dealer, institutional and Standing Order discounts are applied.